Toys are a crucial part of every child’s development. Play doesn’t just have to be fun – it can also be a wonderful and productive time for learning. 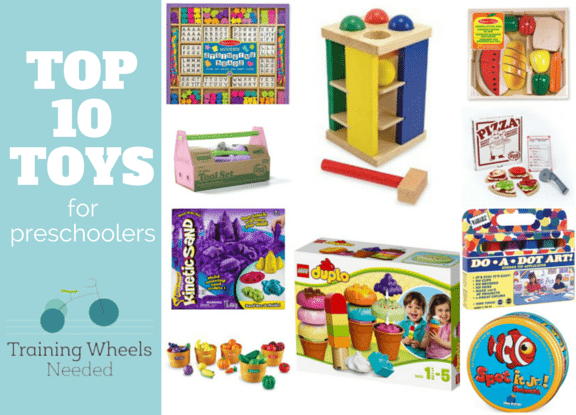 Here are my top 10 picks for toys with a purpose. “These beads will help develop a child learn sorting, patterning, and strengthen hand eye coordination.” Lots of wooden letter beads, gorgeous shapes and brightly colored laces are packed in a handy wooden tray to create fabulous bracelets and necklaces. “Hand eye coordination and cause and effect are integral to this tower.” Brightly colored, smooth-sanded pieces help build early shape, color and size differentiation skills. “Why didn’t I think of this? Kids loves these markers and so do I!” Craft projects foster creativity and Do a Dot Markers were designed with kids in mind. With no cups or brushes, it’s a fun and clean art project for kids. “This perfect parlor will help your child learn sorting, sizing, and expand their imagination.” It features a collection of colorful brick scoops of tasty ice cream, fun toppings and cone. Your child will love to stack the large, tactile bricks and serve up fun ice cream combinations. “This is a great set for understanding parts of the whole such as 1/2 and 1/4.” It features a storage crate, seven sliceable fruits and a knife. It’s hands-on fun with this unique toy perfect for creative play. “Textures are a great building block for learning.” This sand is kinetic – meaning it sticks to itself and not to you. It oozes, moves and melts right before your eyes. Kinetic Sand stimulates children’s creative skills allowing them to create anything they can imagine over and over again. It also never dries out. “This fun market is perfect for dramatic play and role playing.” Your child can also develop color recognition and sorting skills with bushels of realistic, relationally sized produce. Includes Activity Guide, 25 foods and stickers for labeling 5 baskets. “Tools aren’t just for boys!” Any project is possible with this whimsical tool set. It includes a tool box, phillips screwdriver, flat screwdriver, hammer, saw, wrench, pliers, 2 two-hole connectors, 2 nails, 2 bolts, and 2 nuts. “Another fun toy for dramatic play and learning parts of the whole.” Pizza lovers can pretend and play chef and server by taking orders, creating custom pizzas, and serving guests. The set includes 4 pizza crusts, 20 pizza toppings, a pizza cutter, order pad, and pizza “delivery” box. “Spot It is great for strengthening visual discrimination and general cognitive skills.” Each card has 6 colorful animals of different sizes. Between any two cards there is always one animal match. It develops attention, visual perception, speech-language, and fine motor skills. What other toys are your favorites for making learning fun?